The challenge posed by SporTV to broadcast the Rio 2016 Olympic Games resulted in unprecedented coverage aired globally on TV and impressive figures that reflected the success achieved. With 16 commented and narrated channels on Brazilian pay-TV and 56 internet broadcasted channels, more than 4,000 hours were broadcasted. A project that had the involvement of 1,591 professionals willing to prove that the dream of broadcasting 100% of the Olympic Games is possible. In just 17 days of the Rio Olympic Games, SporTV channels reached 38 million viewers. This number represents an increase of 29% more viewers compared to the 2012 London Olympics. The channels also led the audience with a range of 27% greater than the sum of all the SportsChannels competitors. Among the most watched sports, volleyball was the sports discipline that drew the most SporTV viewers’ attention, followed by soccer. These two sports disciplines had the highest participation in the Olympics’ audience, repeating the same trend as the 2012 London Olympics. Adding these sports disciplines to athletics, basketball, and gymnastics, SporTV channels reached 27 million viewers. On average, all the sports disciplines, besides the ones already mentioned, grew by 168% compared to the last Olympics, and canoeing is the sports discipline that had the highest growth: 635%, thanks to the three historical medals got by Isaquias Queiroz. Special attractions were also successful, highlighting “É Campeão” a program hosted by André Rizek. Altogether, 9 million people followed the comments of former Olympics champion athletes, among them the Romanian Nadia Comaneci (gymnastics), the Americans Mark Spitz (swimming), Carl Lewis (athletics), Bart Conner (gymnastics), Michael Johnson (athletics), and the Cuban Javier Sotomayor (high jump). The program reached an absolute leadership in the sports segment, on average, 198% more viewers than the competitor network audience best place. 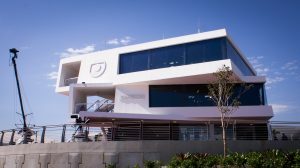 The SporTVChannels coverage in the biggest sporting event on the planet had the use of three new studios: the Olympic Studio, in partnership with Globo Group, one on Abelardo Bueno Avenue having the Olympic Park as a backdrop and the other one at the channels own headquarter. The team worked hard to make sure the games were aired in the house of subscribers, mainly through SporTV Play and SporTV Rio2016 apps. The investments in technology have also allowed the SporTV coverage to be seen in a wide variety of electronic devices. In addition to the 56 channels available online, with live content and also on demand — that could be watched on smartphones, tablets, computers, game consoles, and smart TVs — broadcasting was in 4K technology (ultra high definition) and also in virtual reality (VR), developed in partnership with Samsung. The games were on just for a few days, but the SporTV 2016 app was one of the most downloaded, having 1.1 million downloads. Having access to all SporTV channels, apps had 6.8 million hours via live streaming, including tablets, smartphones, and laptops. You can also say that Rio2016 has won not only the public in general, but especially women and young people. SporTV network tripled the audience in all the clippings: among men, 227% growth and among women, impressive 410%. According to the age range, the channels grew in Children 04-11 (+ 235%), teenagers 12-17 (+ 267%), youth 18-24 (+ 316%), and adults 25 years and older (+ 286%). Having the positive feedback after such planning and boldness, SporTV evaluates that the channel’s brand finished the event even stronger and more consolidated as a reference in all sports. The amount of positive posts in social media reinforces this analysis, which is complemented by the importance of partners and sponsors support.